Mark Wilson/Getty ImagesJohn Hickenlooper and John Kasich. Ohio Gov. John Kasich fuelled speculation about a possible 2020 “unity” ticket on Monday. The ticket would be comprised of himself, a Republican, and Democratic Colorado Gov. John Hickenlooper. Both Kasich and Hickenlooper have denied the possibility of such a ticket in the past. The rumoured 2020 “unity” ticket for president stirred the pot on Monday, fuelling some renewed speculation about a pair of term-limited governors’ plans for the presidential election. Since last summer, Republican Ohio Gov. John Kasich and Democratic Colorado Gov. 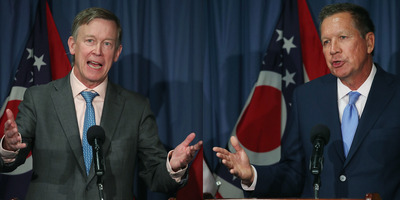 John Hickenlooper have been rumoured to be considering the cross-party ticket, which would feature Kasich at the top and Hickenlooper as his running mate. The two have frequently appeared side by side to focus on influencing the national healthcare debate. At the time, both Kasich and Hickenlooper denied that such a ticket was in the offing. But on Monday, Kasich garnered some attention when he tweeted about a trip Hickenlooper is taking to Iowa – a state long known to be a place where potential presidential candidates test the waters. Hickenlooper sought to quell any speculation with his response. Meanwhile, John Weaver, Kasich’s chief strategist for his 2016 campaign, tweeted about “what a coincidence” it was that Kasich was travelling to New Hampshire, another early primary state, while Hickenlooper visits Iowa. Reached by Business Insider, Weaver said “there are no more rules in this business” when asked if Kasich was teasing the unity ticket. In August, when the rumours first started, Weaver told Business Insider to expect to see plenty of appearances from the governors. “They work very well together and will continue to lead on healthcare, immigration, and probably other key issues,” Weaver told Business Insider in an email, adding a smiley emoticon.